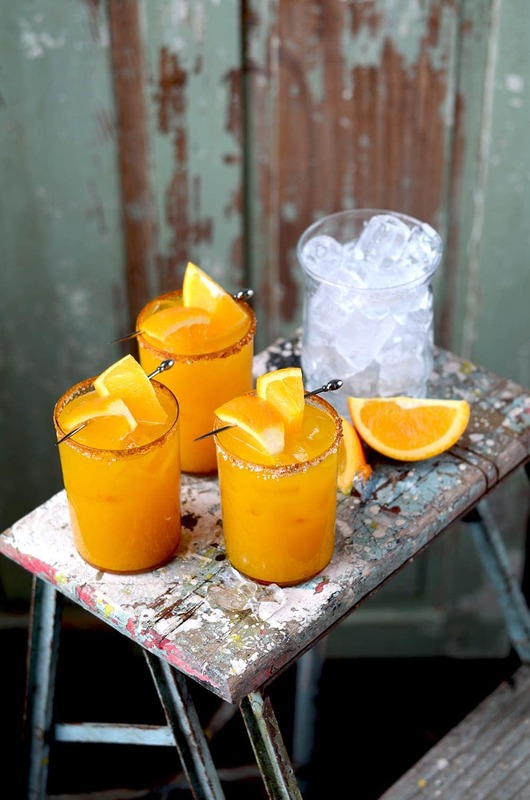 Orange Turmeric Margaritas are a sweet and smoky take on the classic cocktail. Homemade simple syrup. fresh juice and a salty, spiced rim make these drinks extra special but are still easy to make. Celebrate National Margarita Day with a margarita from scratch! Seriously….step away from that bottle of margarita mix! Learn how to make a margarita with just a few real ingredients! (Feb 4). You can’t make this stuff up….except you can because if you go to the National Day Calendar you can discover all the wonderful, and mostly unofficial, celebrations you’ve been missing. But today is NATIONAL MARGARITA DAY!!! Sorry to shout but I love margaritas so I’m excited to share a margarita recipe with you! That’s not to say there’s no room for variation! Two of my go to margarita flavors are watermelon and cucumber, but this Orange Turmeric Margarita is becoming a fast favorite. It’s sweet, loaded with fresh orange flavor and smoky thanks to the turmeric. Turmeric? I know it might sound as crazy as National Bubble Wrap Appreciation Day (Jan 25) but I promise you its so good! The turmeric intensifies the orange color and adds a bit of earthiness to the cocktail. This recipe is fresh, simple and a great way to celebrate the magic and versatility of the margarita! So let’s toast to National Margarita Day, a holiday we can actually enjoy! Cheers! WARNING: Turmeric is very orange stuff! It can easily stain clothing and surfaces. I suggest making these cocktails on a cookie sheet while wearing an apron! Turmeric adds a smoky flavor to this margarita. 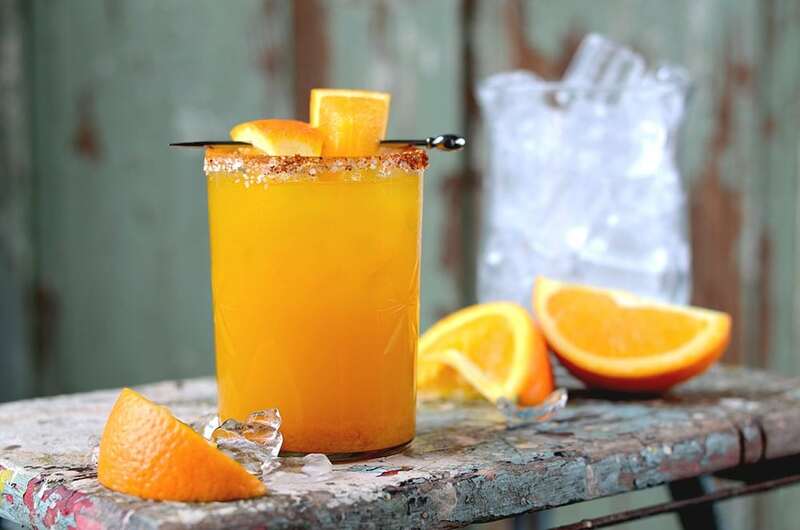 If you like a sweeter margarita, use two ounces of orange juice, instead of one. In a small sauce pan, combine sugar, water and turmeric. Place over medium heat and bring to boil. Strain syrup through a coffee filter. Combine ancho, turmeric and salt on a small plate and mix to combine. Wet the top of a glass with a wedge of orange and sip in spice mix. Fill a cocktail shaker with ice and add orange juice, tequila, triple sec and simple syrup and shake. 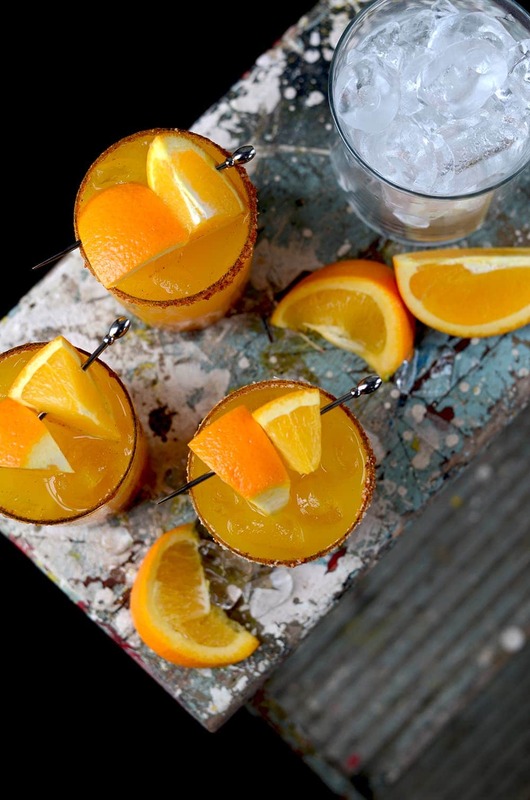 Pour into glass and serve with orange wedges. 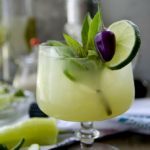 Spicy Thai Basil Cucumber Cocktail is a sweet way to enjoy the heat of late summer! Literally! With hot peppers and savory Thai basil, this drink is cool and refreshing, with a nice, slow jalapeno burn at the finish. 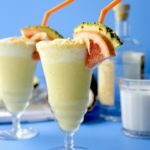 Summer is not over yet, so whip up one of these rich, creamy Piña Coladas from scratch and cool down in style! They are frozen, smooth, pineapple-y, sweet, and perfect for your Labor Day festivities. When it’s crazy hot outside, fresh watermelon makes the sweetest, most cooling margaritas. Best part is that these Watermelon Margaritas are trimmed with garnish made from the rind! So clever and tasty! 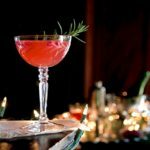 Bubbly hard cider, fresh pomegranate seeds and springs of rosemary come together to make a festive holiday drink. Let’s toast to the season! I can’t wait to celebrate National Margarita Day after work! Margs are my go-to drink and yours look incredible. What a great flavor combo! Beyond that your pictures are GORGEOUS! Thanks Erin! I’m looking to the end of the workday too! Salsa and margaritas are on the menu tonight! I love all the flavor combinations of this! The sweetness of the orange, the earthiness and smokiness of the ancho chili powder-I’m so excited because I have fresh oranges from my tree. I have to make these. And thanks for the calendar link. I was recently wishing for an app, blog, or website that mapped out all these national food holidays. I’m very jealy of your fresh oranges! I can’t wait for spring. I’m longing for home grown food! I’m so giggling at ‘National Static Electricity Day’! Hilarious. This cocktail looks wonderful – turmeric is my favorite spice and this drink is my favorite color! I’ll be making this very soon! Some of these national days make me laugh too! I can’t wait to go wild on National Zipper Day!!! Holy cow, does this margarita look good! Me and margs have a tumultuous relationship, but I’d be willing to give them a go again for one of these. The color is beautiful, and I love the addition of tumeric to make them a little different. So good! My hubby also had a run in with tequila that left a lasting impression! I have to taste test margaritas on my own 😉 If you give them a try let me know what you think. Beautiful photos! Love the addition of the turmeric! This sounds delicious and your photos a super fun! I also love those glasses you used. Margaritas are always good, right? Can you believe I got the glasses for 20 cents each at a fleas market? Great post. I will be trying this tonight. It’s exactly what I need after a hard days work. 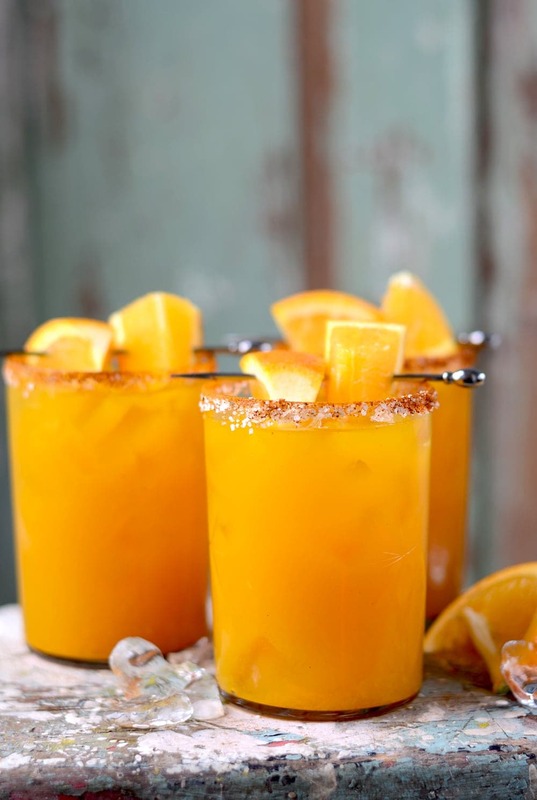 I love how you added turmeric to these margaritas, it gives it a more unique and interesting flavor and presentation! Great recipe! Thanks Eden! Glad you liked it. Thanks for the recipe. Wonderfully sweet and smoky. The color is my husband’s favorite color and flavor. This is very smooth with 100% agave tequila. Definitely a new household favorite!